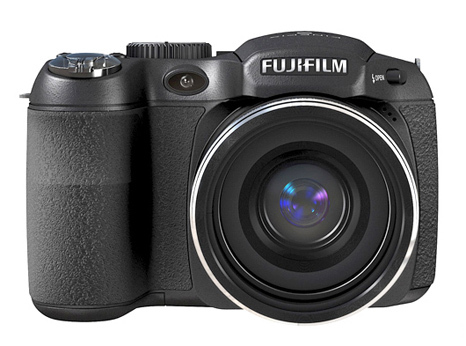 The FujiFilm FinePix S1800 is a camera that sits in between the manufacturer's point and shoot and digital SLR lines, offering a larger body, sturdier construction, and more sophisticated zoom options to justify the very slight increase in price brought about by moving to a larger, better-built camera. The camera measures 4.3" by 2.9" by 3.2" and weighs 11.9 ounces excluding accessories, making it relatively easy to transport. The camera captures images using 12.2 effective megapixels processed by a 1/2.3" CCD. It stores images in 23MB of internal memory or on an SD or SDHC memory card. It stores still images in the JPEG format (compressed via Exif 2.2), movies in AVI (containing motion JPEG with sound), and audio in WAVE and in mono. It captures images at a number of resolutions depending on the aspect ratio configured; in 4:3, it can shoot at 4000 by 3000, 2816 by 2112, and 2048 by 1536, in 3:2 it shoots at 4000 by 2664, 2816 by 1864, and 2048 by 1360, and in 16:9 at 4000 by 2248, 2816 by 1584, and 1920 by 1080. The camera captures video in standard definition at 320 by 240, 640 by 480, and in high definition at 1080 by 720. The camera has an 18x optical zoom lens, considerably larger than any of the point and shoots in Fuji's various lines. This is among the more pronounced selling points in the camera's feature set, as it can perform much more sophisticated zoom operations. Its range is between F3.1 (Wide) and F5.6 (Telephoto), and the lens has a focal length of between f=5.0 and 90.0 mm, equivalent to between 28 and 504 mm on a 35 mm camera. The camera also has a 6.3x digital zoom, allowing for zoom operations as far as 113.4x when combined. The camera's aperture, in Wide, is F3.1 / F6.4, and in Telephoto is F5.6 / F11.0. Its focus distance, in Normal mode, is between 1.3' and infinity in Wide and between 8.2' and infinity in Telephoto. In Macro, the camera's range is between .2' and 9.8' in Wide, and between 5.9' and 9.8' in Telephoto. In Super Macro, the camera's range is between .1' and 3.3'. The camera's sensitivity can set itself automatically, but it can also configure via ISO equivalents of 64, 100, 200, 400, 800, 1600, 3200, and 6400, though ISO 3200 and 6400 only support resolutions of 3 megapixels or less. The camera has exposure control through TTL 256-zone metering, spot, and multi control. The camera offers several exposure modes: programmed auto exposure, shutter priority AE, aperture priority, and manual settings. The camera's image stabilizer is a CCD-shift type. The camera's mode dial offers settings of SR AUTO, Auto, P, S, A, M, Custom, Movie, Panorama, SP, and its SP modes are Portrait, Landscape, Sport, Night, Night (Tripod), Fireworks, Sunset, Snow, Natural Light, Natural Light & with Flash, Beach, Party, Flower, Text, Smile, and Zoom Braketing. The camera's shutter speed is between 1/2000 and 1/4 seconds, and 1/2000 and 8 seconds. The camera can take continuous shots at a maximum speed of up to 8 frames per second. It offers either a single autofocus or continuous autofocus. Its self-timer delay can function between 2 and 10 seconds. The camera has automatic shade recognition, as well as many presets: Fine, Shade, Fluorescent light (Daylight), Fluorescent light (Warm White), Fluorescent light (Cool White), Incandescent light, and custom settings. The camera has an automatic flash with an effective range, in Normal, of 1.3' to 26.2' in Wide and 8.2' and 14.4' in Telephoto. In Macro, the camera has a range of between 1' and 9.8' in Wide and 1' and 5.9' in Telephoto. Flash modes are based on Red-eye removal being off or on: forced flash, slow synchro, slow sync. The camera has a .2" electronic viewfinder with a 200000 dot color LCD viewfinder that offers 99% coverage in shooting and 100% coverage in playback. It also includes a 3" LCD offering 230000 dots of coverage. It offers 97% coverage for shooting and 100% coverage for playback. The camera has an instant zoom, intelligent face detection with red-eye removal, high-speed shooting, histogram display, and a silent mode. The camera has an NTSC/PAL selectable video output that can be configured if necessary. The camera takes its power from 4 AA type alkaline batteries, but can also be powered by AA-sized Ni-MH or lithium batteries. A DC coupler with an AC power adapter is also available. The camera's USB cable is proprietary and must be replaced through Fuji, as other manufacturers do not make a suitable replacement available. Beyond replacement cables and batteries, Fuji offers very few accessories. A FinePix HD player is available to connect SD media to a television or other source.